The UVEV Demo and Forum was a blast! 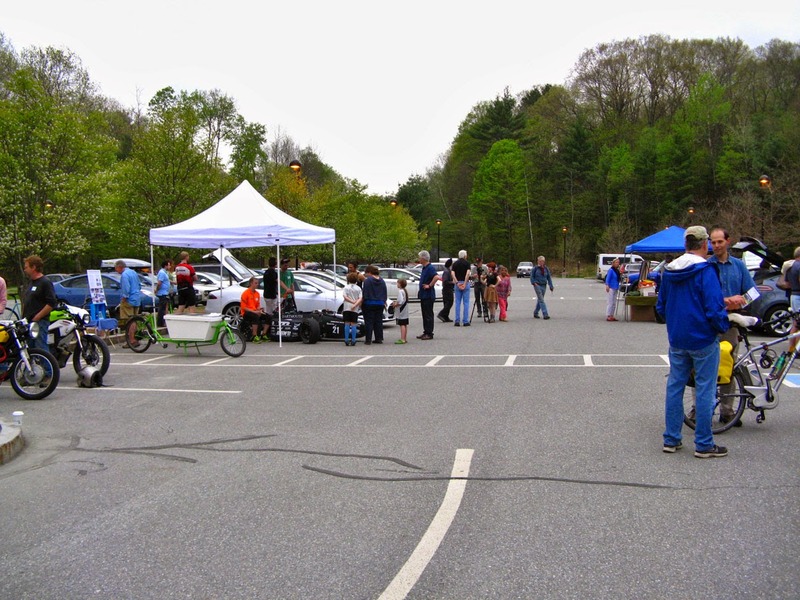 There were about 20 owners and 3 dealerships that had signed up, and what actually happened was a full capacity crowd. Every spot in the parking lot was taken and then some. We had to enlist Erin Sterner and Sarah Simonds to direct traffic (thanks for your help!) 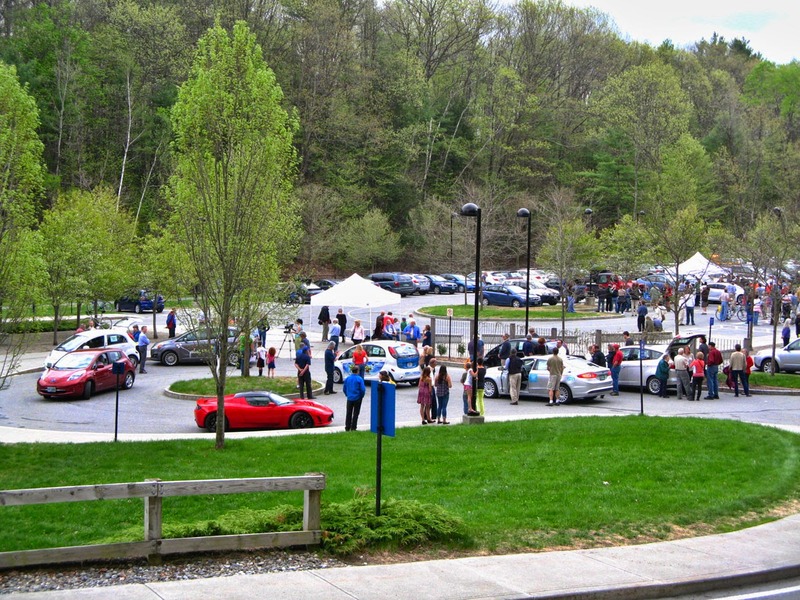 There were about 250 people in the parking lot, networking with owners, taking test EV rides and ebike rides, a race car display and electric motorcycles, and electric vehicle builders. It's been two weeks since the event, and I can still feel the tremendous energy from the group. 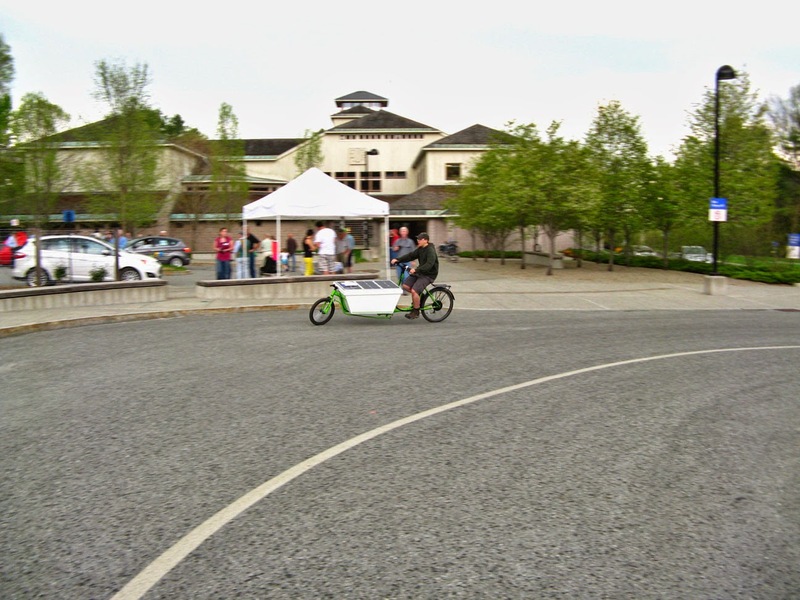 My display was the bike, (which was out for a test ride in this photo), the new battery box for the next bike with an explanation of the modules inside it, and a poster explaining the use of electric Cargo Bikes as a car substitute. 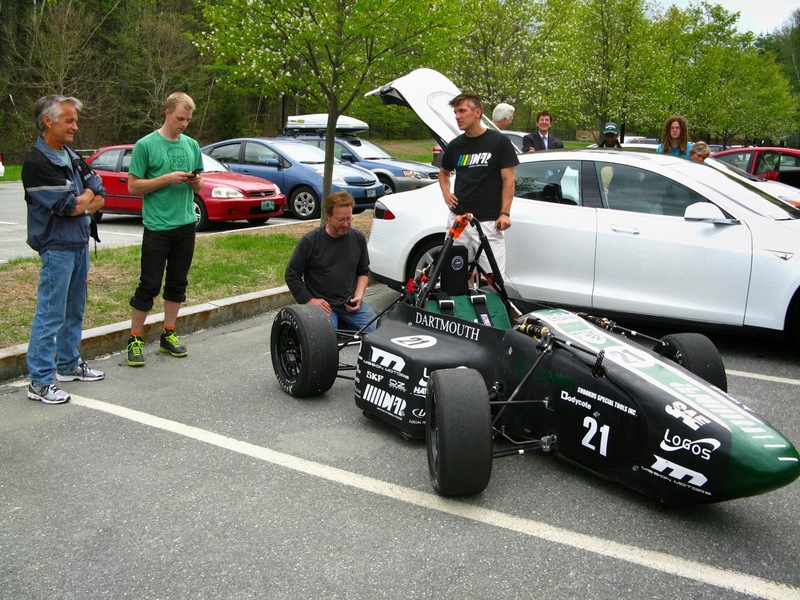 The person in the green shirt is Keith Dewey, who drove his SmartEV up from Londonderry, a one way distance of 65 miles, and had 40% of battery range left. He recharged his car at the King Arthur Flour public charging station before heading back. 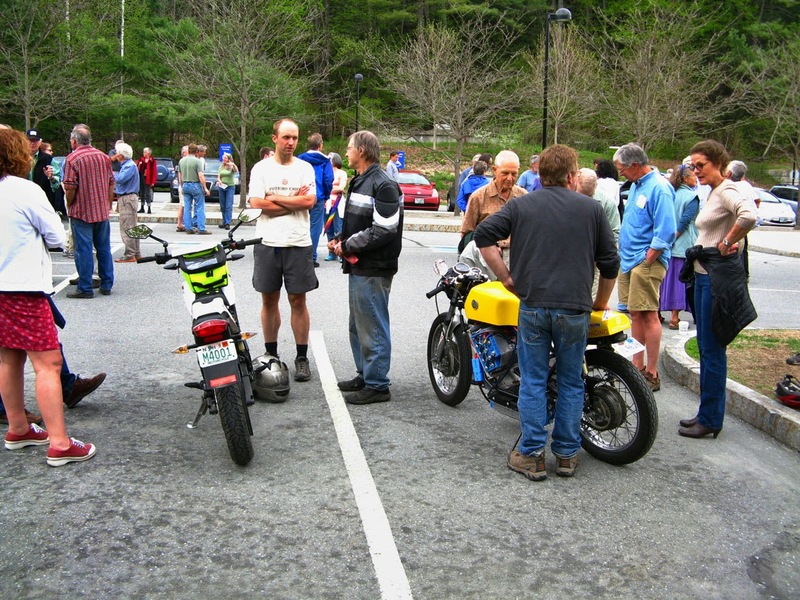 Since this is a blog about bikes, I would like to emphasize a point that I think almost everyone at the event did not fully appreciate. 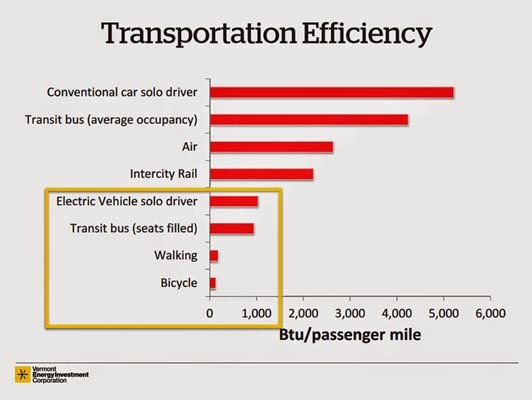 This graph is the 4'th slide from the evening's presentation- notice the energy use of bikes. 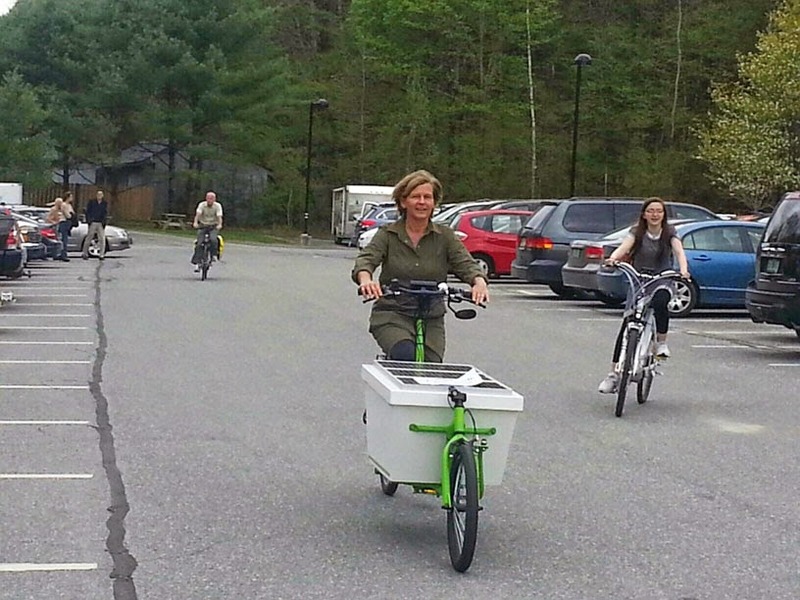 Electric cars are a big improvement over gas cars, but a bike is another order of magnitude better. 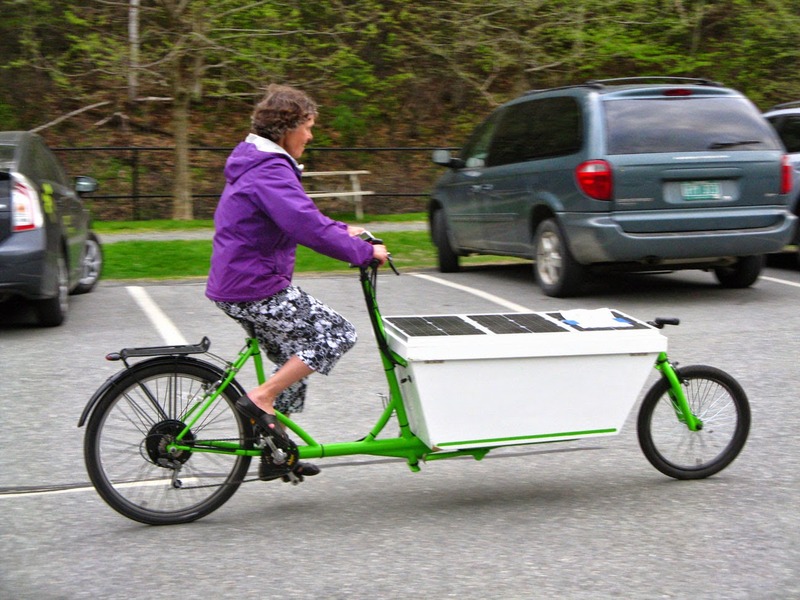 This can be seen in my records from last summer's energy use for the solar electric cargo bike of 13.2 watt hours per mile, which is equivalent to 2553 mpg. 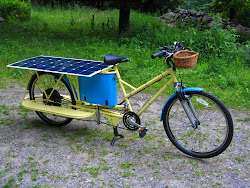 Some weather protection and racks can be added to a bike for utility use, and it will still be far better than any other mode of transportation. We need to question our belief that it is necessary to have 3,000 or 4,000 pounds of metal around us to get us down the road. Or, to quote Thoreau speaking in a time before there were cars- "How many a poor immortal soul have I met well nigh crushed and smothered under it's load, creeping down the road of life, pushing before it a barn seventy-five feet by forty, it's Augean stables never cleansed, and the labor of one hundred acres of land, tillage, mowing, pasture, and woodlot." 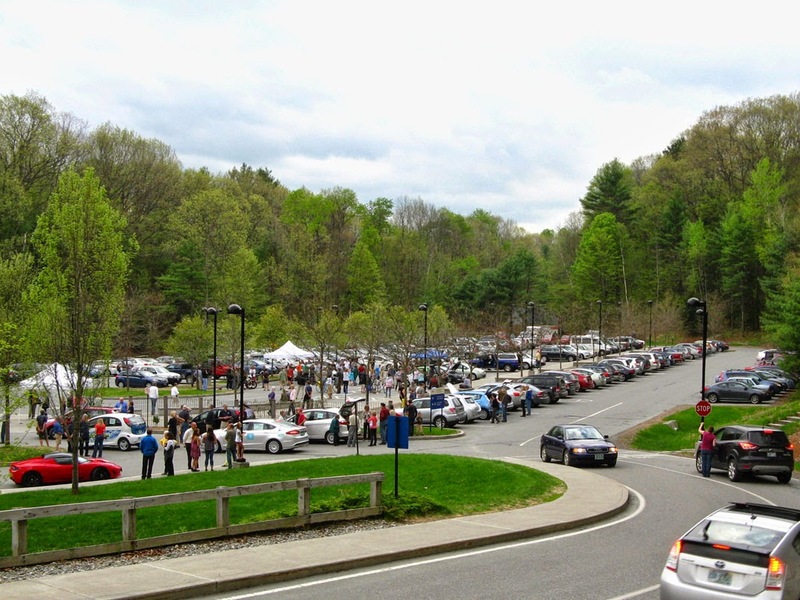 Now the best way to reach Walden pond is by car via a large highway. Even back in the 1940's my mother used to drive out to the beach there with her teenage friends from South Boston. Some people just cruised along. I have to confess there were two accidents with the bakfiets. A friend of mine was riding around the curve near the display, and fell down. After making sure she was OK, I got on the bike to try to figure out what was wrong (because I had never fallen down on it), and I fell down. It turned out that a brief shower had moistened the pavement, and for several feet on the curve there was something like silicone on the road that became slippery. After 10 minutes it had dried out enough to be normal traction again. 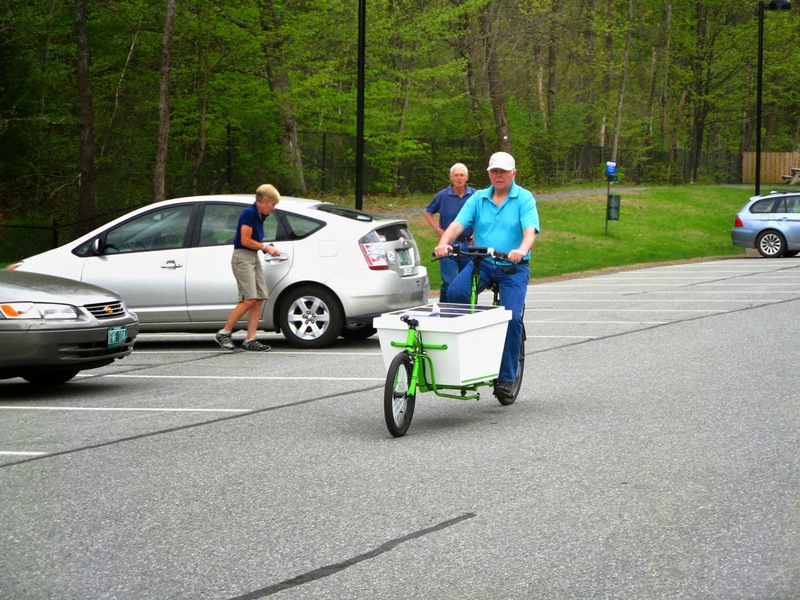 This was more than strange, as I'd ridden the bakfiets in light to pouring rain before, and even last winter on frozen roads with snow and ice, where the only problem had been spinning the rear tire if I pedaled hard while the motor was on. (Studded tires could have helped.) Traction has been superb. I can now say the mode of falling for a bakfiets is a roll onto the side, and the damage is scuffing up the back corner of the box. My friend ended up laying on her side, I stopped on my back, and then we both stood up and looked at the bike. 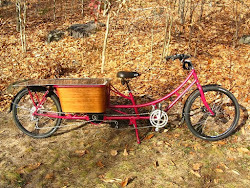 When my sister heard about the falls, she told me that I should build tricycles, and that she would not put her granddaughter Maddy in my bakfiets (even though Maddy would be protected inside the box). This actually made me feel better about my plans for building the next two bikes as two wheelers, because sometimes when my sister tells me to do something, it's turned out better if I don't. I've got some educating to do here- I don't think she understands that the severity of a crash is directly related to the speed, and thinks a bicycle crash is the same as a car crash. 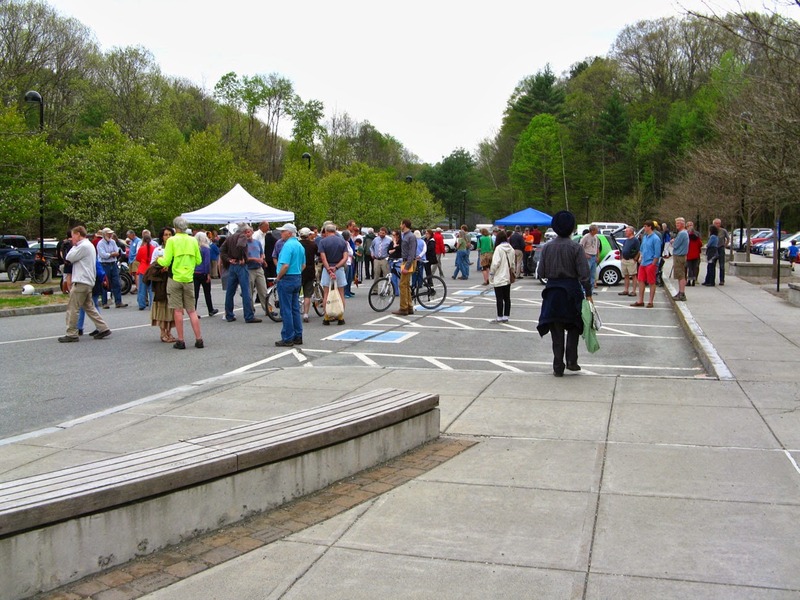 However I will say that there are better places to fall than in front of a couple hundred people at an event you organized to show how good electric vehicles are. The "gas tank" is a hollow shell covering controllers and batteries. 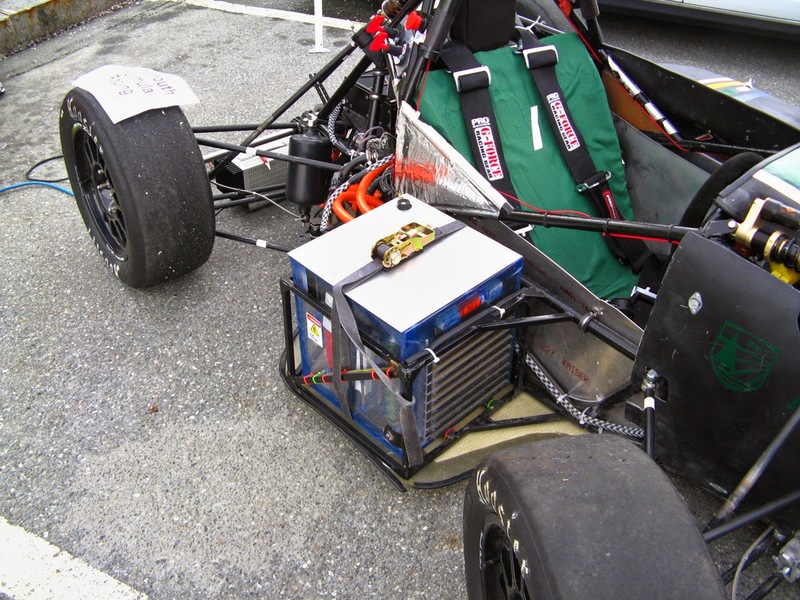 The DFR car was packing a lot more battery than my bike (this is one side). 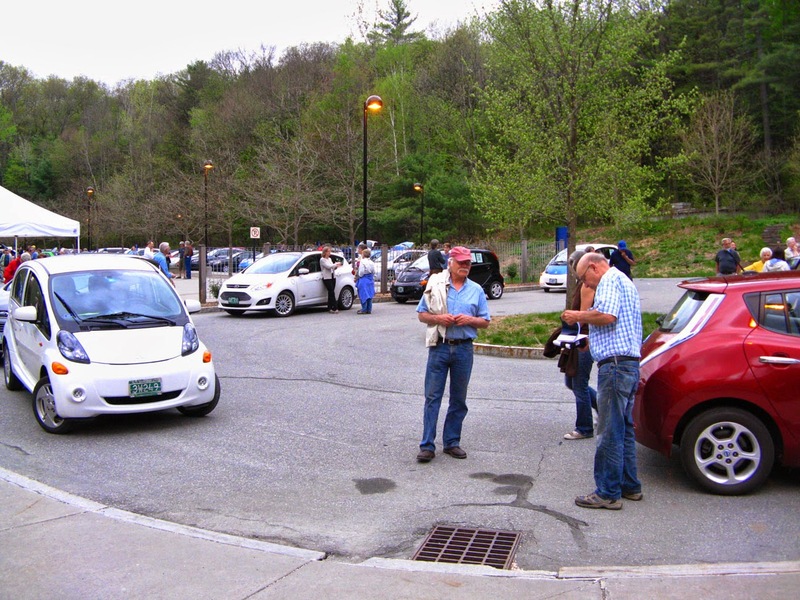 Many more EV's were lined up around the circle at the entrance, with the owners offering rides around a 3.8 mile loop along the Connecticut river and up into Norwich, or 2.4 miles over to the charging station at King Arthur Flour. Various Nissan Leafs, Mitsubishi I-MiEVs, Teslas, and Ford Focus and C Max's lined up at the test ride circle. A frequent comment was how quiet the cars were, as drivers waited for pedestrians to notice there was a car waiting to pull out. This photo was taken during the presentation, the rides continued on through it, which was not planned. 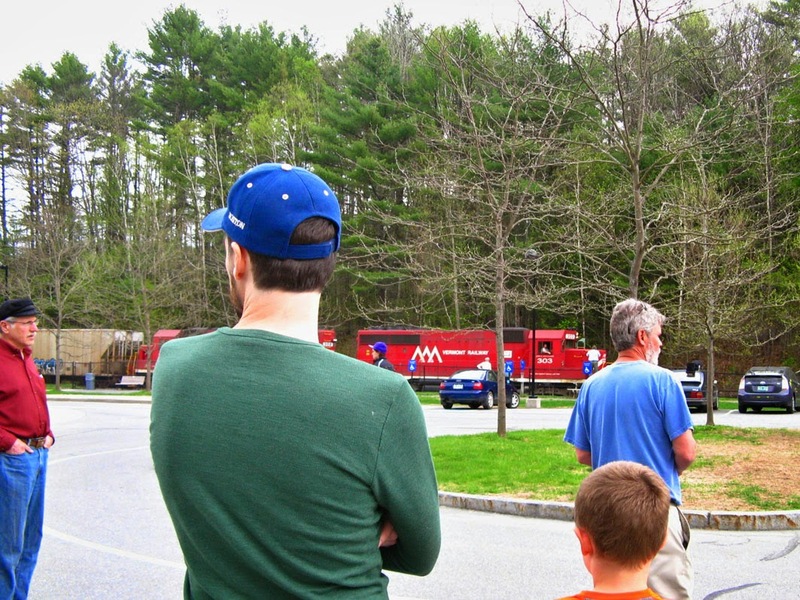 Almost as if it were part of the event, a Vermont Railways train rolled through on the track between the museum and the river. 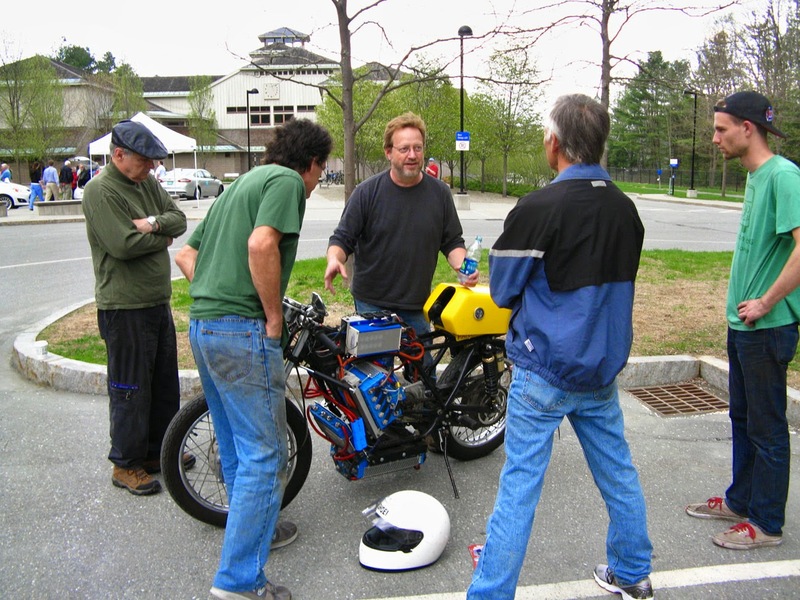 Larry Gilberts of Zoombikes (http://www.zoombikes.net/) in the blue shirt is watching test riders on some Evelo electric bikes that he brought to the event. 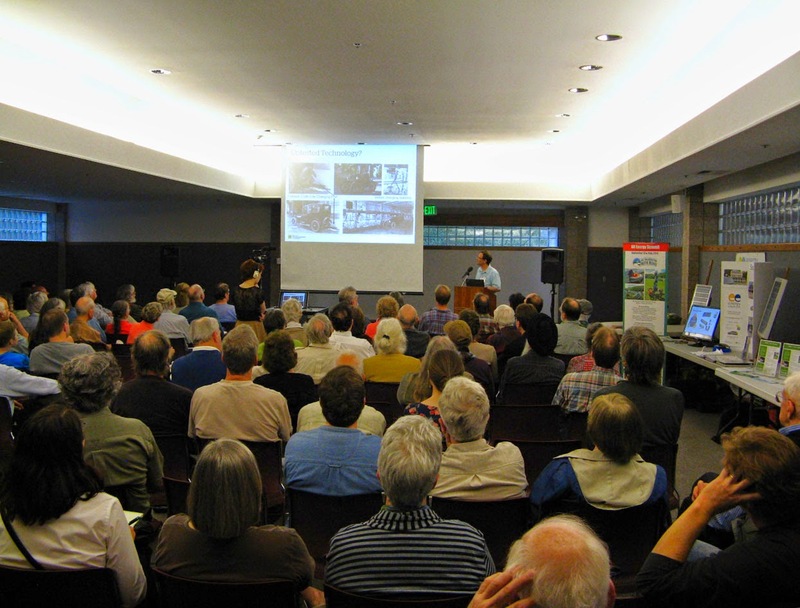 Dave Roberts of Drive Electric Vermont (http://www.driveelectricvt.com/) gave the Forum presentation to about 150 people. 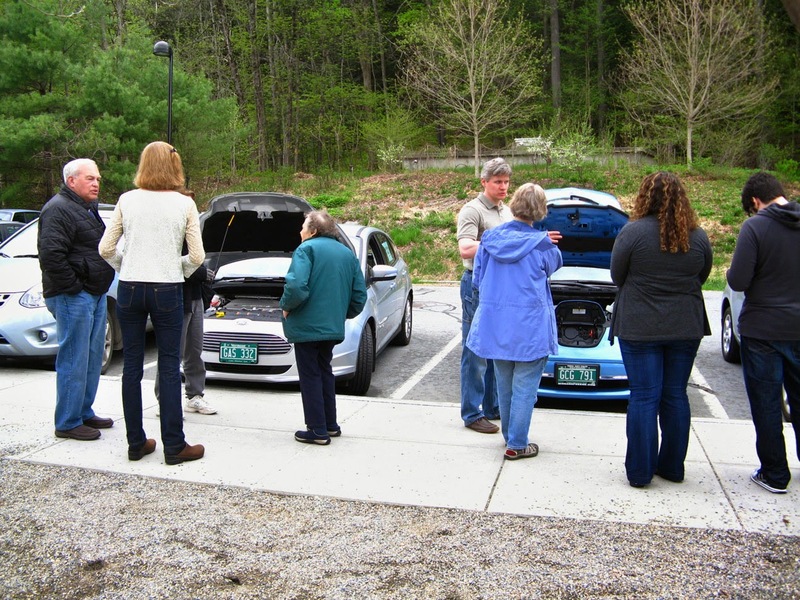 Drive Electric Vermont has been given the task of promoting and coordinating EV development in the state, and they have a lot of resources available on their website- they are the ones to speak with if you are a car owner with questions, or a business who wishes to install a public charging station. (The slides from Dave's presentation can be downloaded here.) Along the right side of the room were displays from the Mount Washington ALT Energy Summit, charging your EV with a solar array (from Enfield Energy Emporium), Drive Electric VT info, the other UVEV forum co-organizer Sustainable Energy Resource Group, and on the left were ChargePoint public charging stations and Voltrek (www.voltrek.com), Lamoille Valley and St J. Ford, Solar Fest, and my group- the Upper Valley Sierra Club. 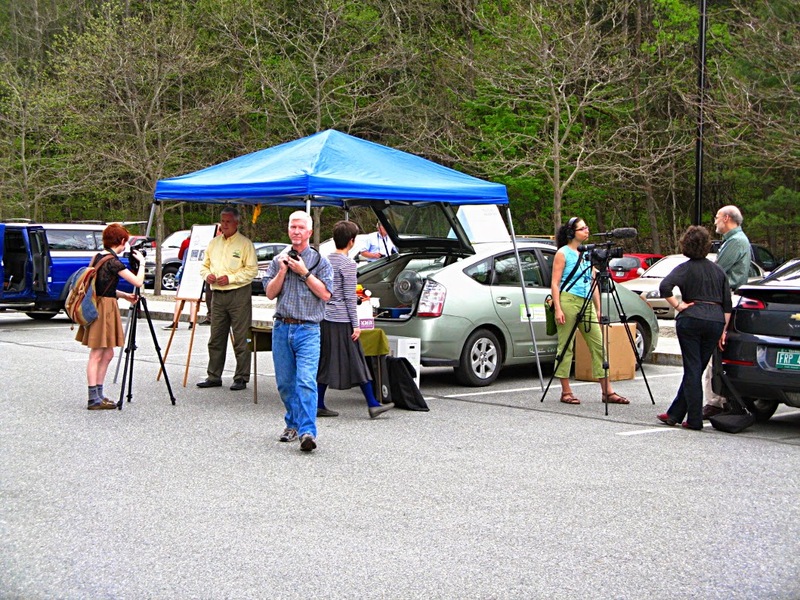 In the last few years the national Sierra Club organization has become more proactive, and now has programs promoting both renewable energy and electric vehicles. 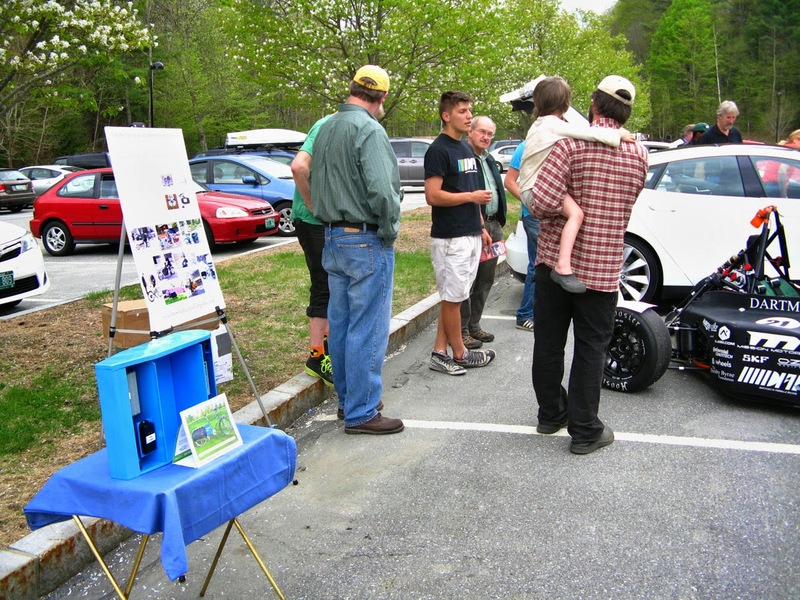 Their EV events organizing info page is at https://driveelectricweek.org/resources.php. by a couple dozen owners, and repeat several times during the evening. Thank you to Catherine Cramer, Keith Dewey, Bob Jacobson, Kim Quirk, Tofer Sharp, Julie Mullen, Alan Johnson, Linda Gray, Charlie Reibel, Lucy Gibson, Greg DeFrancis, Kathy and Jeff Parsonet, John Minelli, Phil Desmond, Richard Lammert, Todd Lockwood, Charlie McKenna, Wendy McArdle, Margaux Leblanc, Ted Dillard, Bill Cable, and several other car owners who dropped in and I don't know their names. Cheap Electric Scooter UK on the off chance that they discrete. This is particularly basic with control driven hoverboards. It isn’t sufficiently just to know whether there is an accreditation at any rate it is in addition fundamental to know to what degree does it last. No not precisely a multi year guarantee is agreeable.